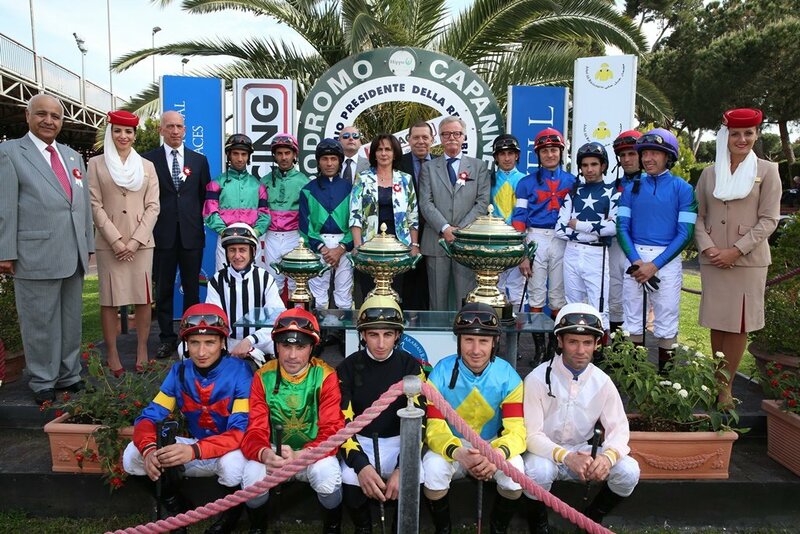 9 May 2016, Rome, Italy ~ Sunday 8 May saw the renewal of Shadwell’s sponsorship of a day of thoroughbred racing at Rome’s Capannelle Racecourse supported by 2 Arabian races under the banner of the Dubai International Arabian Races. The Arabian races included the first ever IFAHR approved stakes race to be run in Italy, the Premio Dubai International Arabian Races 2016 (Listed PA). The 1900m race for colts, fillies and geldings of 4 years old and up attracted 15 runners including international competition from France and Holland headed by Vulcain Du Clos. The son of MONSIEUR AL MAURY travelled easily throughout the race and finished strongly to take the first Listed PA contest in Italy from the Karin van den Bos trained Athlete Del Sol. Vulcain Du Clos, Athlete Del Sol and the highest placed Italian horse Tornado ByZucchele (3rd in the race) will all be eligible to compete at Newbury on 24th July for the DIAR Bonus Fund of 2016. The addition of an IFAHR Listed race to the program of races on “Dubai Day” was the culmination of the hard work of the Ministry of Agriculture in Italy and the Italian Arabian organizations responsible for breeding and racing ANICA and IREAHA. The Listed race was complemented with the Premio Shadwell Arabian Stallions Stakes, a conditions race aimed at Italian horses. This was an 11 runner race over 1500m. Of particular note in this race was the Stephano Botti owned and trained Unu Di Gallura-PSA. Botti, one of the most successful trainers of Thoroughbreds in Italy has recently started training Arabian horses. The interest of such a prominent trainer in Arabian racing is an illustration of the enthusiasm the Italians have for their new-found international status. It was however Endo Botti who trained the winner of the first Arabian race of the day. Urge Di Gallura, an unbeaten 3YO colt, ran an excellent race to finish clear of a competitive field. Endo Botti has 100 thoroughbred horses in training and now 6 Arabian horses in his yard in Tuscany. To celebrate the first Listed PA race run in Italy, Shadwell Arabian Stallions made a prize draw among the Italian owners and breeders for a free nomination to MADJANI: this was won on the day by Mr G Floris, the owner of Tabasco, a runner in the Listed contest. All other entrants in the draw have been offered free nominations to JIYUSH and EAU ROYAL – a gesture from Shadwell Arabian Stallions to support the breeding of Arabian horses in Italy. In addition to the Arabian races, companies from Dubai including Emirates Airline and Jebel Ali Racecourse, sponsored a card of Thoroughbred races with a total of 58 runners between them. Shadwell and its partners have been supporting Thoroughbred racing in Italy for over 15 years; the work is particularly important as Shadwell stand 2 Thoroughbred stallions at Allevemento Besnate. MUJAHID is a multiple Champion sire in Italy and the sire of CLEO FAN the last winner of the Premio Presedente della Republica while it held Gr.1 status. Besnate have recently taken over management of the Gr.1 winning son of Oasis Dream, ARCANO who is standing his first season in Italy and proving popular with breeders.